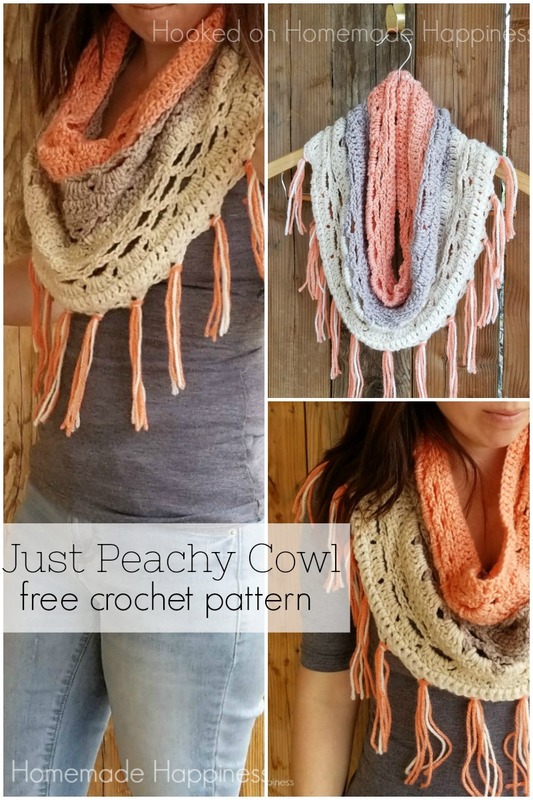 And I have yet another Caron Cake pattern, the Just Peachy Cowl Crochet Pattern! I can’t help myself! I’m obsessed, I tell ya! I made this cowl using Strawberry Trifle. I loved the peachy pink with the creams and grays. I wanted it open, airy and fringe-y. 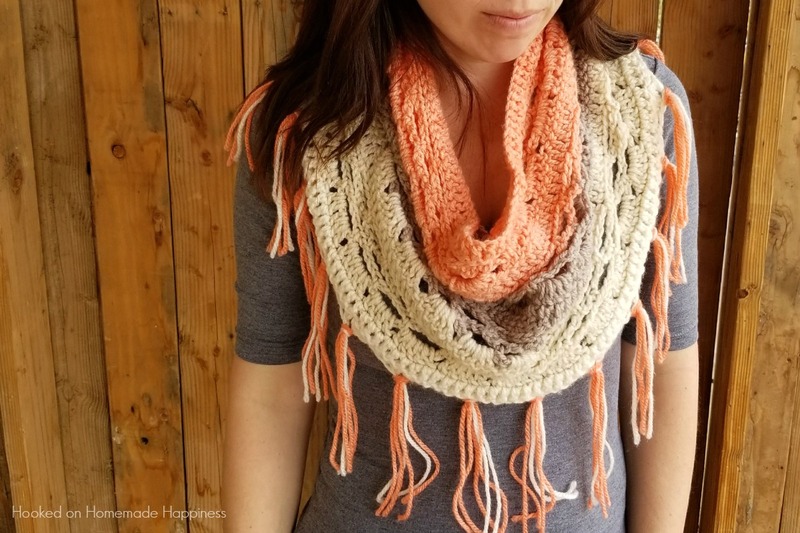 It’s not too thick, so it could be worn in the springtime or on cooler summer nights. If those exist… I live in the desert so summer is hot all the time. But I was able to rock this cowl a couple times before we started hitting the high 90s. The 100s are coming soon and once they do… nice weather is all over for us. 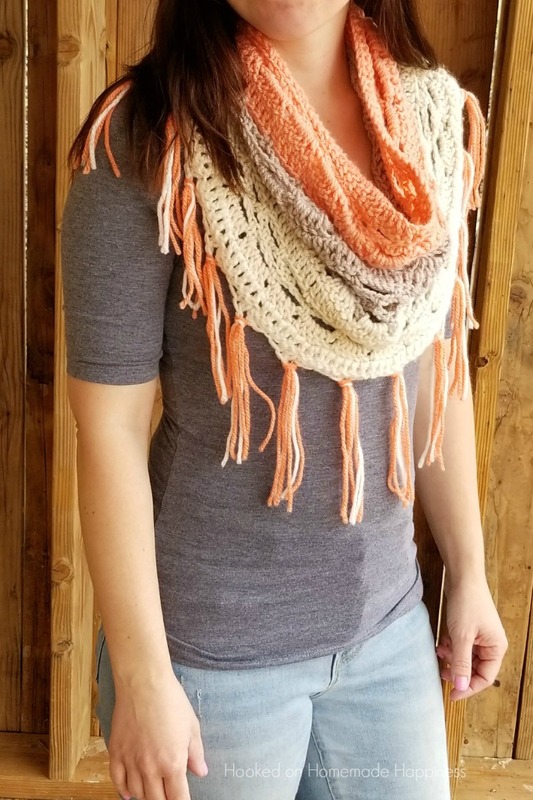 I loved this scarf so much I made one as a teacher gift for my Mini Me’s preschool teacher. For this one I used Rainbow Sherbet. Dare I say I liked that one even better and I really wanted to keep it for myself. But I didn’t! 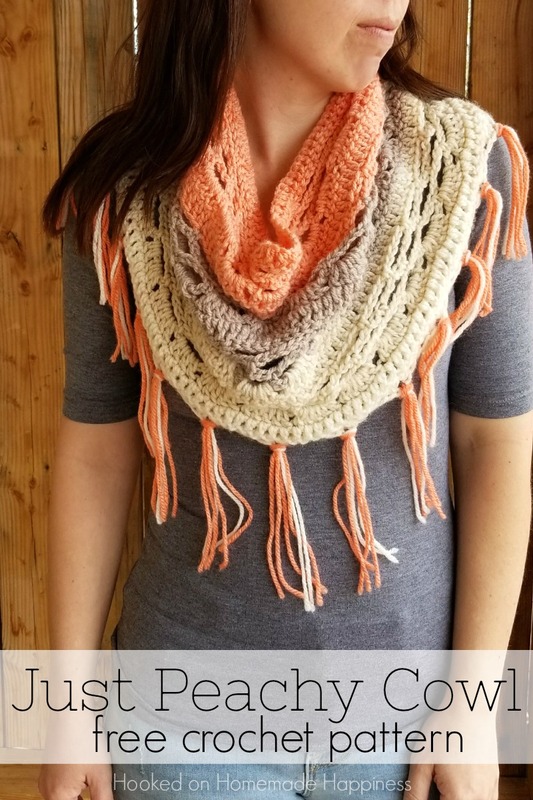 -Get the free pattern below or This pattern is available as an inexpensive, clearly formatted, PDF instant download in my Etsy shop or Ravery Shop! This cowl is worked in rows and both ends are sewn together. The pattern starts in the center of the cowl and gradually gets wider. Do not fasten off, sew both ends of the cowl together using a slip stitch. Fasten off, weave in the ends. Add fringe to each ch 2 space from the last row. I used 3 12 inch pieces in each space. Trim to your liking. So pretty! Love both color schemes ? Just finished this for the most part. However when attaching the ends the yarn is one color and when going up the colors don’t match and it looks off. Is there a way to stitch where you don’t see the seem? Hi Krislyn, I don’t know of any way to stitch two pieces together without seeing a seam. Maybe… I’m not sure how the increasing would work out? Hi Mona! You can easily increase the starting chain (as long as it’s a multiple of 5). The cowl is worked in rows and the rows increase towards the outside of the cowl. I added a pic of me wearing the cowl so you can see what it looks like on. Hope this helps! I agree …. I just made 2, one with 80 chains and the next with 90. Very snug to the neck with both lengths. I would try the next one with 120 chains and go from there. Lovely pattern to work up though! Love the pattern easy to follow too. Thank you for sharing ? Hi there, I was wondering do u have this pattern on a video. I’m new to crochet and I’m still learning how to read patterns. I just finished one and it turned out beautiful. Thank you for such an easy and beautiful pattern. 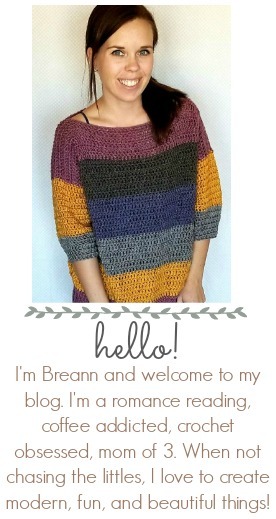 Hi Breannot, I love your cowl. pattern at end of row 13 says you have 17 chain 5 spaces and 2 chain 3spaces which I do. But I cannot seem to get 20 chain 5 spaces on row 14. Can’t figure what I am doing wrong! Thanks. Hi Judy! Did you add the extra ch 5 space at the beginning and end? Help….. after crocheting the 80 chains and you start row 1 you say chain three, and start with double cr in the 4th ch. from hook, so you are chaining 83 chains?? I completely do not undersyand the increase. Do you have any photos that can explain it or a video? Hi Ashleigh, no I don’t have any other tutorials for this scarf. Instead of skipping over the first ch 3 space in the row and moving to the ch 5 space, put your first sc in the ch 3 space. This will give an extra ch 5 space at the beginning and end of the row. I hope this helps! Somehow I ended up with far less chance 5 spots than you but oh well 🤷 it still looks fantastic and I can worry about it next time. Thank you for the beautiful pattern! Just finished and sewed up the seam. Is the front supposed to be where the seam is? Seems like it should be in the back but with the increase it’s longer on the seam side. I wear the seam on the back. Just wondering what does ”sc to the end” means? Thank you! Ok so the edge is not straight? Thank you for this pattern. I worked on it this evening using Sweet Roll. It worked up quickly and easily. Still need to do the fringe, but really like it. 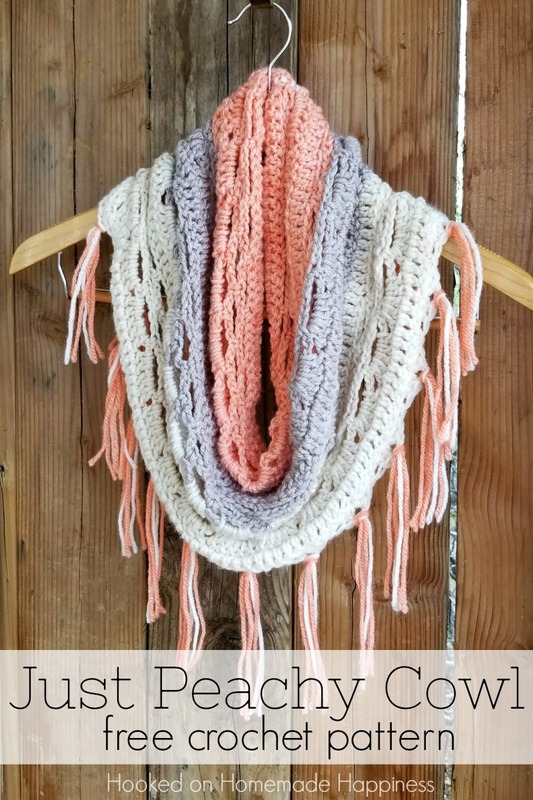 I am on the hunt for the same yarn you used…love the color scheme. I like how it is airy but will keep me warm. 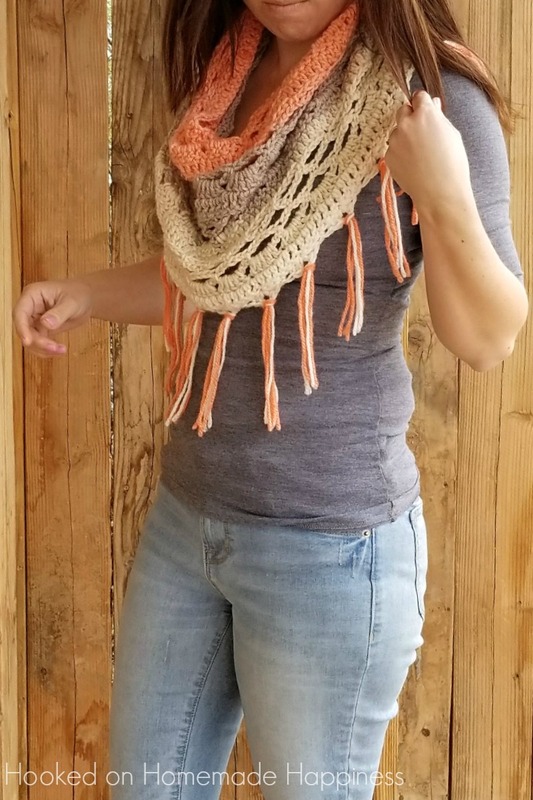 Hint for anyone else crocheting this cowl is to count when finishing a row to make sure you have the correct 5 spaces. Will be making more of this cowl. Thank you again!! On your Row 3 when you say sc in ch 5 space am I just putting one sc in each ch 5 space or 5 sc? I just completed my third of this cowl. Since I had made this previous, I added 15 more stitches. It definitely gives me more room. Thanks for the pattern. Easy to do. I might try it in the round next time. Are you counting the chain five as a stitch on row 2? Hi, row 4 how are you getting the increase from 15 to 16 spaces …..if I’m not increasing in either chain 3 spot how do I get the increase? Thanks for your help….